Here’s the third award nomination I’ve received this week. I particularly love this one because of it’s title and it’s image of the Gerber daisy. Thank you My Botanical Garden for the nomination. Your blog rocks! 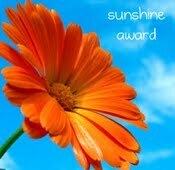 The award requires expression of gratitude (thank you again, My Botanical Garden), ten things about me, and my ten nominees for the Sunshine Award. Ten Blogs that bring SUNSHINE to my life – please check them out!